Want an afternoon activity that flexes the creative muscles? We’ve found it. The Scribbler Drawing Robot is a two stage project that involves two different creative outlets – building and art. First step is creating the robot – all you need is a hot glue gun and glue, plus a battery – everything else is included in the kit. 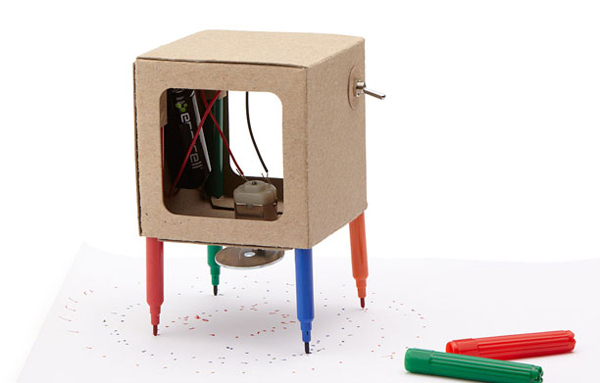 Once the robot construction is complete and you’ve inserted your textas, watch the Scribbler Drawing Robot dance across the paper as its motor vibrates along. Abstract art is the Scribbler Drawing Robots forte and will be a hit for keeping little children entertained during craft sessions. We expect everyone in the family will have a robot masterpiece gracing the fridge in no time. Parent supervision is required for children aged under twelve during robot construction due to electronic components. Scribbler Drawing Art is available from Perpetual Kid and is priced US$26.30 with delivery to Australia available.